Correcting the validnode_checking. I got this issue resolved. [oracle@Linux03 Desktop]$ sqlplus /"As sysdba"
One or more PDB names, specified as a comma-separated list. The ALL keyword to indicate all PDBs. The ALL EXCEPT keywords, followed by one or more PDB names in a comma-separate list, to indicate a subset of PDBs. Team OTN at CloudWorld DC, CloudWorld Developer Mumbai and Collaborate! Team OTN wanted to make sure you stop by to say hi at the next few events we'll be attending. Look for us to help you get set up with an Oracle Could Trial Account, watch our community managers conduct interviews with community experts, learn more about community.oracle.com and get the latest OTN T-shirt. Register for one or all of the events listed below today! Join us to learn how you can leverage Oracle Cloud Platform technologies for the complete development lifecycle! Explore Oracle PaaS that enables you to deliver better quality code with the agility you need to meet today's IT challenges. This conference empowers users of Oracle business applications and database software to gain greater value from their Oracle investments through real-world education and networking. Don't miss IOUG Pre-Conference Workshop: Cloud Attack that is being facilitated by some of our Oracle ACE's. Recently, Pythian hosted a number of Velocity of Innovation (Velocity) events. I moderated two of these: one last June in New York, and one in November in San Francisco. Another event in Sydney, Australia was moderated by Tom McCann, senior customer experience analyst with Forrester. Our Velocity events have given us unique insights into what IT professionals in various regions see as their top priorities or concerns. And although we always framed our discussions with similar questions, it was interesting to see the different directions they took in each location — especially when it came to the topic of innovation. So what makes a particular region fertile ground for innovation? And can you measure it? The Global Innovation Index (GII) ranks countries based on a multitude of indicators of innovation. The United States ranks number 2 on the GII, behind Switzerland, while Australia is number 17, out of 141 countries. According to the GII website, the index aims to capture the multi-dimensional facets of innovation and provide the tools to assist in tailoring policies to promote long-term output growth, improved productivity and job growth. The ideas discussed in the US and Australian locations seemed to align with the GII results, with US panelists expressing more positive attitudes and concrete ideas on how companies can improve agility and become more innovative. And while being at the forefront of technology in the Asia-Pacific region, the Australian panelists and audience members described more cautious approaches to achieving innovation. Early in the Sydney panel discussion, Chris Mendez, executive consultant big data and analytics from Industrie IT, sparked a lively discussion about innovation by asserting that innovation is lacking in that region. “I actually don’t think there’s enough innovation in Australia, in particular. There’s a lot of talk about it, people are doing a lot of experiments, and there are some companies who’ve set up business purely based on tool sets that use data to innovate. But there are a few things that seem to be working against innovation, and I think one of those things is that it doesn’t stand on its own,” Mendez said. According to Francisco Alvarez, vice president, APAC at Pythian, the risks associated with innovation might be holding companies back in Australia. “The main problem for most companies is that innovation equals risk,” Alvarez said. Alvarez also commented on what it takes to make innovation work. “If you take a step back and look at the companies that are doing well in the market, you can see that there is one factor that differentiates them: they were not afraid to try to innovate. And because of that innovation they are getting their share of the market and gaining ground. Just look at the financial market. CBA was considered crazy a few years ago for all the investment they were making in technology, social media, apps and so on. They got ahead. And now everybody is trying to do the same,” he said. Mendez thinks that innovation needs to start from the top. “I think there’s also a very big misunderstanding at board levels about innovation because boards are there to actually stop you changing your business. The fundamental tenant is: ‘We’ve got a great business model here, it’s running well, we’ve got to make sure that any change to it doesn’t damage that.’ There’s a natural caution at board levels and it’s totally understandable,” he said. While cautious, the Sydney panelists expressed that they thought there is hope for more innovation in the future. They expressed a need to proceed slowly, watching what works for innovation leaders. “The key is to have a balance,” Alvarez said. If you were to put our New York panelists on Geoffrey Moore’s https://en.wikipedia.org/wiki/Geoffrey_Moore Technology Adoption Lifecycle, you might classify them as early adopters, rather than true innovators. Not surprising, since New York’s competitive industries such as banking and publishing rely on innovative technologies, but they don’t create them. According to New York panelist, Forrester Analyst Gene Leganza, what makes an enterprise agile is the ability to sense what’s going on in the marketplace and to quickly respond to it. But, he said that innovation comes at a cost. “The flip side of agility is innovation. An interesting aspect of innovation is getting really hot talent into your environment. Getting the right talent and doing smart things and being leading edge are challenges. You have to figure out what level to drop in on, where you are in the industry. You need to determine if you are a startup or a state organization that needs to be a fast follower,” Leganza said. Otto Toth, CTO at Huffington Post warned that innovating quickly is not always in the best interest of the business, or it may not be the way to do it properly. He asserted that quick innovation can actually work against the business, and that instead of making your business faster, being very agile can slow everything down. “Too many decision-makers just slow down the process. It’s better to have a few people or a core team who make the decisions and come up with new features,” he added. Leganza went on to describe what it takes at various levels of the organization. He said that there’s a notion at the engineer level that agility means bureaucracy won’t get in their way. Then there’s agility at the enterprise level, which is about reducing risk and understanding how soon change can be in production. “The higher up you go, the more people are going to be receptive to what improves the whole portfolio rather than one project. This is where architects come in. They have been hands-on, but have the credibility and knowledge to guide the organization more strategically,” Leganza said. In San Francisco the narratives on innovation were quite different. Although cities don’t have their own GII ranking, you might assume that the West Coast IT leaders are the innovators. And judging by the discussion at the San Francisco event, this assumption seemed to be true. Cory Isaacson, CTO at RMS was one of our San Francisco panelists. His company runs catastrophe models for some of the world’s largest insurance companies, like scenarios that will tell what a disaster like an earthquake or hurricane might cost them. Isaacson has been working on bringing big data and scalable systems together to create a new cloud-based platform. “At my company some of the things that we’re trying to do are, honestly, more advanced than most other things I’ve ever seen in my career. But when you’re doing innovation, it is risky. There’s no way around it. There is a lot to evaluate: from different algorithms to the risk models and the catastrophe models,” said Isaacson. Sean Rich, director of IT at Mozilla added to the San Francisco discussion by talking about some of the concrete innovations his company is working on. They’re taking a partnership approach to enable agility. “Innovation is doing something new. In an effort toward achieving agility, one of the things that we’re doing is enabling the agility of our business partners, by changing our own operating model. Instead of traditional IT where we run all the services and infrastructure necessary to drive the business, we’re taking more of an enabler or partnership approach,” Rich said. “We’re now doing things like encouraging shadow IT, encouraging the use of SaaS applications and helping them really do that better through different service offerings like vendor management or change management of user adoption for certain platforms and data integration” he added. “Overall, we’re looking at ourselves differently, and asking what new capabilities we need to develop, and what processes, tools and skills we need to enable agility for our marketing group or our product lines, as an example,” Rich said. Aaron Lee, the Chief Data Officer at Pythian, runs a team that specializes in helping clients harness technology to deliver real outcomes. Usually they involve things like big data, DevOps, cloud, advanced analytics — he’s involved in some of the most leading edge initiatives for Pythian customers. He takes a practical approach to innovation with clients, and said that companies could improve innovation by looking at the root of the motivation for it. “They need to ask: Why are we going down this path, trying to innovate something and what is the value of that thing we’re trying to innovate? “If the shared goals around innovation opportunities aren’t defined in a way that actually lead to success over time, then the business is just like any other organism: it starts to get more risk averse. Then it becomes harder and harder to execute any kind of change agenda. Planning in a way that is likely to have a good long-term outcome, even at the outset of any sort of initiative, is one key success criteria that we put in place to help ourselves and our customers get to a good place,” Lee said. Isaacson added that companies like Google have been known to allow an engineer to take a day a week or a day every two weeks to just look at things. “I think though, the challenge is you have to get your organization up to the point where this is an economically viable thing to do. Once we get more ahead of the curve, I think we could do that kind of thing,” he said. Interested in being a part of a discussion like these? VELOCITY OF INNOVATION is a series of thought-leadership events for senior IT management hosted by Pythian. Pythian invites leading IT innovators to participate in discussions about today’s disruptive technologies: big data, cloud, advanced analytics, DevOps, and more. These events are by invitation only. If you are interested in attending an upcoming Velocity of Innovation event in a city near you, please contact events@pythian.com. To view our schedule of upcoming events visit our Velocity of Innovation page. Now that we have the cost and use out of the way, let's talk about how to consume these services. Unfortunately, consuming raw blocks, either tape or spinning disk, is difficult in the cloud. Amazon offers you an S3 interface and exposes the cloud services as an iSCSi interface through a downloadable object or via REST api services. Azure offers something similar with REST api services but offers SMB downloadable objects to access the cloud storage. 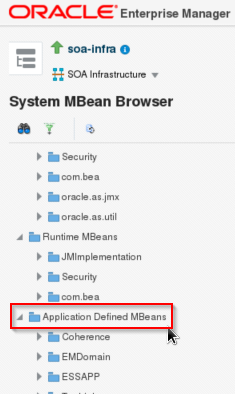 Oracle offers REST api services but offers NFS downloadable objects to access the cloud storage. Let's look at three different ways of consuming the Oracle Cloud services. The first way is to use the rest API. You can consume the services by accessing the client libraries using Postman from Chrome or RESTClient from Firefox. You can also access the service from the c url command line. The second way of accessing the storage services is through a program tool that takes file requests on Windows and translates them to REST api commands on the cloud storage. CloudBerry has an explorer that allows us to do this. The user interface looks like and is setup with the File -> Edit or New Accounts menu item. You need to fill out the access to look like . 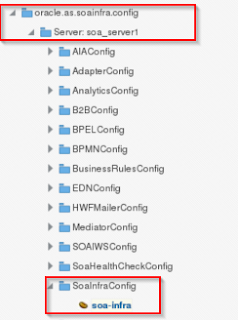 Note that the username is a combination of the identity domain (metcsgse00026) and the username (cloud.admin). We could do something similar with PostMan or RESTClient extensions to browsers. Internet Explorer does not have plug ins that allow for REST api calls. The third, and final way to access the storage services is through NFS. Unfortunately, Windows does not offer NFS client software on desktop machines so it is a little difficult to show this as a consumable service. Mac and Linux offer these services as mounting an nfs server as a network mount. Oracle currently does not offer SMB file shares to their cloud services but it is on the roadmap in the future. 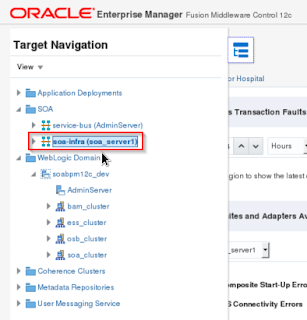 We will not dive deep into the Oracle Storage Cloud Appliance in this blog because it gets a little complex with setting up a VM and installing the appliance software. The documentation for this serviceM is a good place to start. In summary, there are a variety of ways to consume storage services from Oracle. They are typically program interfaces and not file interfaces. The service is cost advantageous when compared to purchasing spinning disks from companies like Oracle, NetApp, or EMC. Using the storage appliance gets rid of the latency issues that you typically face and difficulty in accessing data from a user perspective. Overall, this service provides higher reliability than on-premise storage, lower cost, and less administration overhead. Copyright © ORACLE IN ACTION [I Am Speaking at OTN Yathra 2016], All Right Reserved. 2016. The post I Am Speaking at OTN Yathra 2016 appeared first on ORACLE IN ACTION. Oracle Cloud Platform meets the unique needs of developers, IT professionals, and business users with a comprehensive, integrated portfolio of platform services that enables them to innovate faster, increase productivity, and lower costs. Customers can use Oracle Cloud Platform to integrate existing IT with next-generation cloud services, accelerate application development and deployment, and lead business transformation. Innovate Quickly and Confidently with Platform as a Service. During this 30 minute webinar, Troy Allen will provide a demonstration of how TekStream Solutions uses Oracle Cloud Platform to address specific business needs for modern organizations. We'll also present specific use cases for Human Resources, Legal and Field Services teams. Register today! I tried several optional solutions, like setting the listen-address, that did not work. 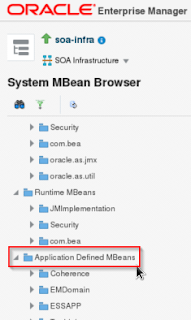 What solved the issue was setting the ServerURL in the System MBean browser of the soa-infra. Restart your server and it should be good to go. Tawny (@iheartthannie) and I attended the 30th Edition of GDC – Game Developers Conference. As shown in the Tawny’s daily posts, there were lots of fun events, engaging demos, and interesting sessions, that we simply could not cover them all. With 10 to 30 sessions going on at any time slots, I wished to have multiple “virtual mes” to attend some of them simultaneously. However, with only one “real me,” I still managed to attend a large number of sessions, mostly 30-minute sessions to cover more topics at a faster pace. Unlike Tawny’s posts that give you in-depth looks into many of the sessions, I will try to summarize the information and take-aways in two posts: Part 1 – Event and Impression; Part 2 – The State of VR. This post will cover event overview and general impression. After two days of VR sessions, this flashback kicked off the GDC Game portion with a sense of nostalgia, flashing games like Pac-Man and Minesweeper, evolving into console games, massive multi-player games, social games (FarmVille), mobile games (Angry Birds), and onto VR games. The cameo for this video is Cary Millsap. If you watch the out-takes at the end you will see the level of respect and trust I have garnered in the community. The words confused and suspicious spring to mind! An honourable mention goes out to James Morle for videobombing. Video : The MERGE Statement was first posted on March 22, 2016 at 8:28 am. 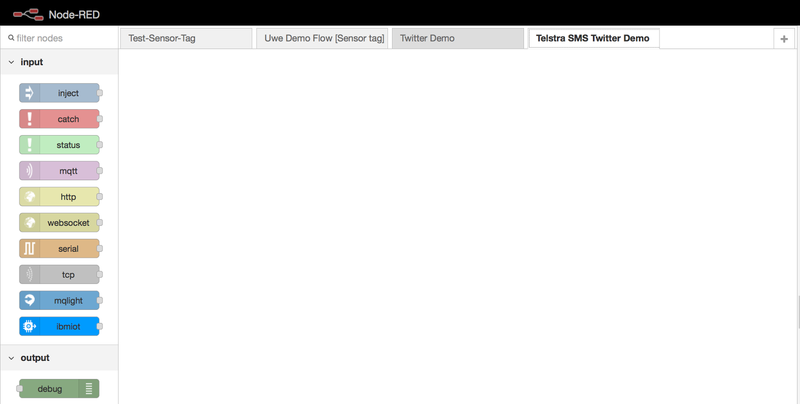 In this example I integrate Twitter Feed with Telstra SMS API to send an SMS based. 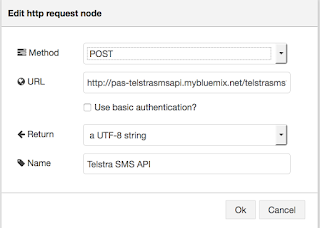 It is based on the wrapper application which exposes the Telstra SMS API on Bluemix as per a previous Post. 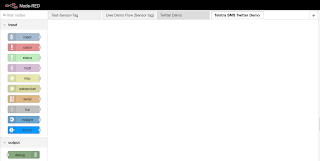 It is assumed you have NodeRed NodeJS application running on Bluemix and are at the Editor as shown below. 2. 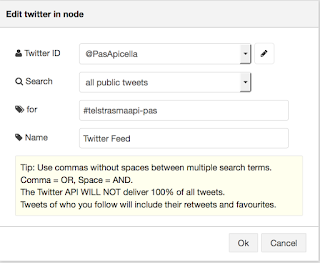 Double click on the Node and ensure you add your twitter credentials and authorize twitter to work with NodeRed itself. 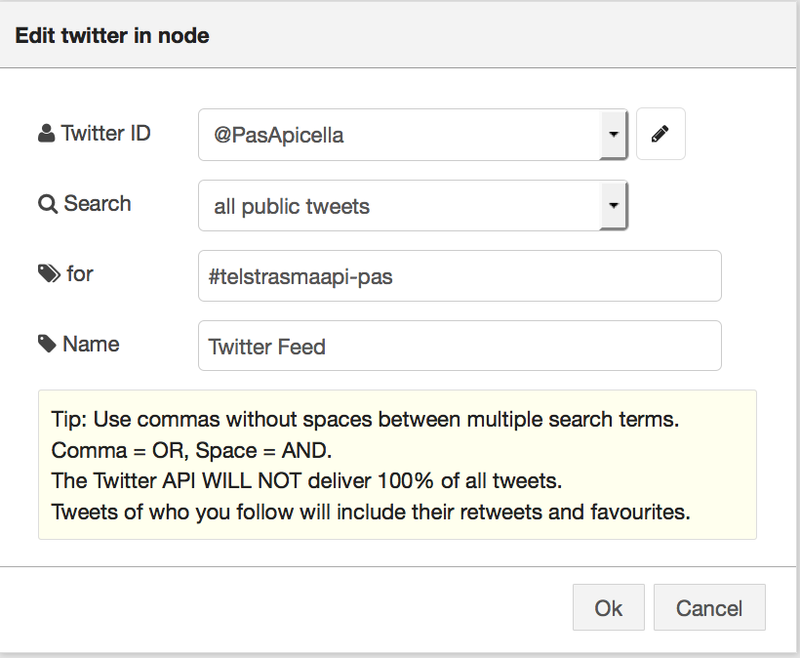 Also use a FOR TAG you wish to receive as part of the feed from twitter, in this demo it is "#telstrasmaapi-pas"
5. Double click on the HTTP Request item and add details as shown below. Note: Ensure URL is changed to the mobile number you wish to use and a BODY you wish to send as part of the TEXT. 6. Connect the twitter node to the HTTP Request node as shown below. 8. Now log into your Twitter account and send a Tweet using the TAG you identified above as shown below. 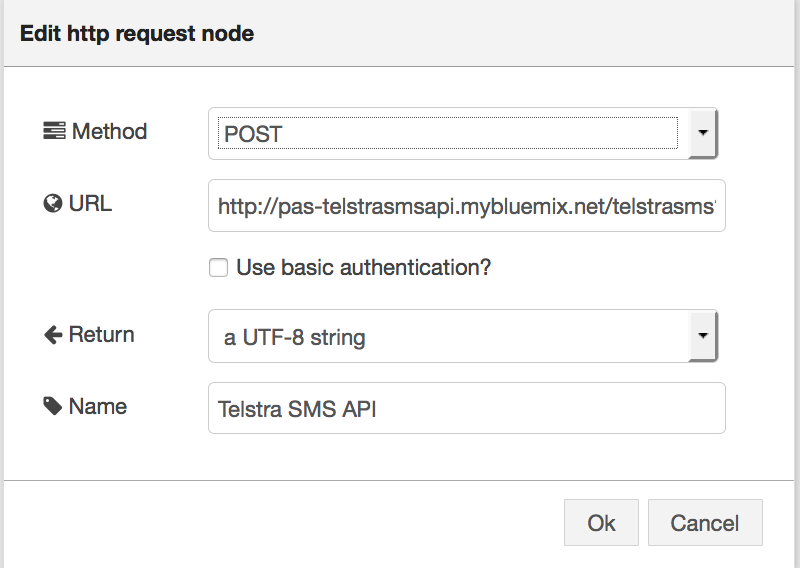 You must use the TAG name you said your looking for in this case "#telstrasmaapi-pas"
9. It should then send an SMS to the identified mobile number you used (Australia Mobiles Only) as shown below. For more information on NodeRed use the link below. One of the frequent requests we get when we demo ABCS is - can I invoke some external functionality that is exposed as a REST service and pass parameters to it. I recorded the demo below that shows you how to do that. It seems that right now you are restricted to accessing REST services that are secured over HTTPS protocol (which is a good thing). Note that you of course don't have to stage the app to see it run, you can just go into live mode, or run it to see it working. I just wanted to make sure I have a demo out there that shows how staging works. as the first link, it will clear the field for you each time you re-press the button. Back in September, our little team got a big boost when we launched official content under the official Oracle.com banner. I’ve been doing this job for various different organizations at Oracle for nine years now, and we’ve always existed on the fringe. So, having our own home for content within the Oracle.com world is a major deal, further underlining Oracle’s increased investment in and emphasis on innovation. The new content focuses on the methodologies we use for research, design and development. So you can read about why we investigate emerging technologies and the strategy we employ, and then find out how we go about executing that strategy, which can be difficult for emerging technologies. Sometimes, there are no users yet, making standard research tacits a challenge. Equally challenging is designing an experience from scratch for those non-existent users. And finally, building something quickly requires agility, lots of iterations and practice. All-in-all, I’m very happy with the content, and I hope you find it interesting. 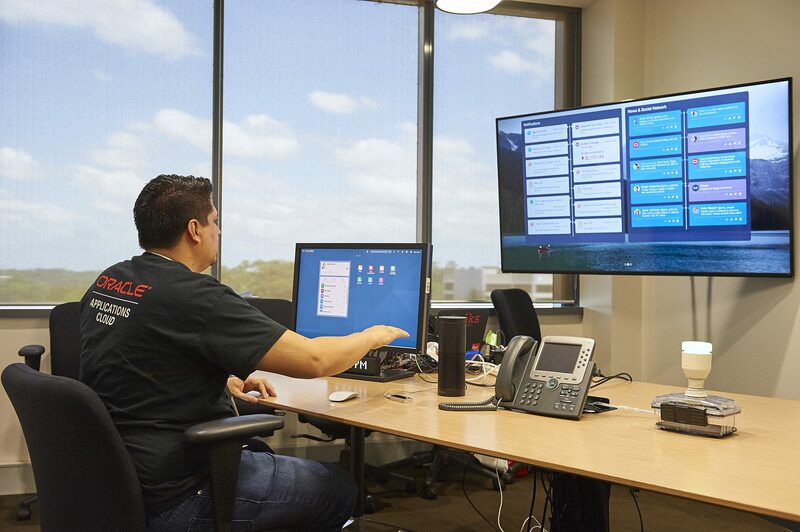 Not randomly, here are pictures of Noel (@noelportugal) showing the Smart Office in Australia last month. 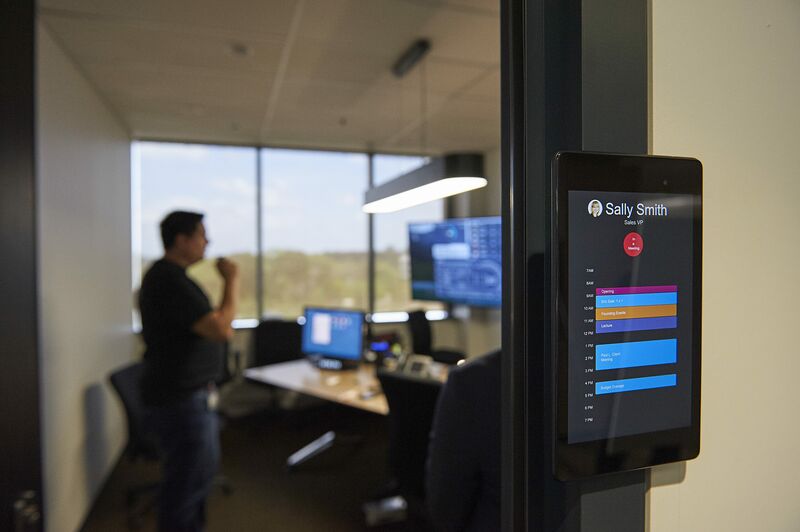 The IoT Smart Office, just happens to be the first project we undertook as an expanded team in late 2014, and we’re all very pleased with the results of our blended, research, design and development team. Big thanks to the writers, Ben, John, Julia, Mark (@mvilroxk) and Thao (@thaobnguyen) and to Kathy (@klbmiedema) and Sarahi (@sarahimireles) for editing and posting the content. The “incremental repair” feature has been around since Cassandra’s 2.1. Conceptually the idea behind incremental repair is straightforward, but it can get complicated. The official Datastax document describes the procedure for migrating to incremental repair, but in my opinion, it doesn’t give a full picture. This post aims to fill in this gap by summarizing and consolidating the information of Cassandra incremental repair. Note: this post assumes the reader has a basic understanding of Apache Cassandra, especially the “repair” concept within Cassandra. 2) It also makes repair network efficient because only rows that are marked as “inconsistent” will be sent across the network. “Incremental repair” relies on an operation called anticompaction to fulfill its purpose. Basically, anticompaction means splitting an SSTable into two: one contains repaired data and the other contains non-repaired data. With the separation of the two sets of SSTables, the compaction strategy used by Cassandra also needs to be adjusted accordingly. This is because we cannot merge/compact a repaired SSTable with an unrepaired SSTable together. Otherwise, we lose the repaired states. Please note that when an SSTable is fully covered by a repaired range, no anticompaction will occur. It will just rewrite the repairedAt field in SSTable metadata. SizeTiered compaction strategy takes a simple strategy. Size-Tiered compaction is executed independently on the two sets of SSTables (repaired and unrepaired), as the result of incremental repair Anticompaction operation. For Leveled compaction strategy, leveled compaction is executed as usual on repaired set of SSTables, but for unrepaired set of SSTables, SizeTiered compaction will be executed. For DateTiered compaction strategy, “incremental repair” should NOT be used. By default, “nodetool repair” of Cassandra 2.1 does a full, sequential repair. We can use “nodetool repair” with “-inc” option to enable incremental repair. Run the default full, sequential repair. Use the tool sstablerepairedset to mark all the SSTables that were created before you disabled compaction. sstablerepairedset is used to manually mark if an SSTable is repaired or unrepaired. The syntax is as below. Note that this tool has to be used when Cassandra is stopped. Please note that with utility sstablerepairedset, you can also stop incremental repair on Leveled compaction and restore the data to be leveled again with the “—is-unrepaired” option. Similarly, the node needs to be stopped first. There are some other things to consider when using incremental repair. For Leveled compaction, once an incremental repair is used, it should be done so continuously. Otherwise, only SizeTiered compaction will be executed. It is recommended to run incremental repair daily and run full repairs weekly to monthly. Recovering from missing data or corrupted SSTables require a non-incremental full repair. “nodetool repair” –local option should be only used with full repair, not with incremental repair. In C* 2.1, sequential repair and incremental repair does NOT work together. Bulk loading will make loaded SSTables unrepaired, even if was repaired in a different cluster. If scrubbing causes dropped rows, new SSTables will be marked as unrepaired. Otherwise, SSTables will keep their original repaired state. Oracle cloud storage is not the first product that performs basic block storage in the cloud. The name is a little confusing as well. When you think of cloud storage, the first thing that you think of is dropbox, box.com, google docs, or some other file storage service. Oracle Cloud Storage is a different kind of storage. This storage is more like Amazon S3 storage and less like file storage in that it provides the storage foundation for other services like compute, backup, or database. If you are looking for file storage you need to look Document Cloud Storage Services which is more tied to processes and less tied to raw cloud storage. In this blog we will look at different ways of attaching to block storage in the cloud and look at the different ways of creating and consuming services. 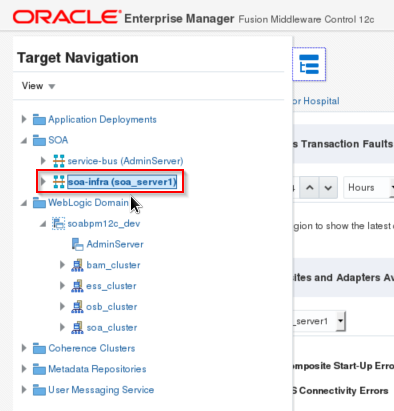 To start off with, there are two ways to consume storage in the Oracle Cloud, metered and un-metered. Metered is charged on a per-hourly/monthly basis and you pay for what you consume. If you plan on starting with 1 TB and growing to 120 TB over a 12 month period, you will pay on average for 60 TB over the year. If you consume this same service as an un-metered service you will pay for 120 TB of storage for 12 months since you eventually cross the 1 TB boundary some time over the year. With the metered services you also pay for the data that you pull back across the internet to your computer or data center but not the initial load of data to the Oracle Cloud. This differs from Amazon and other cloud services that charge both for upload and download of data. If you consume the resources in the Oracle Cloud by other cloud services like compute or database in the same data center, there is no charge for reading the data from the cloud storage. 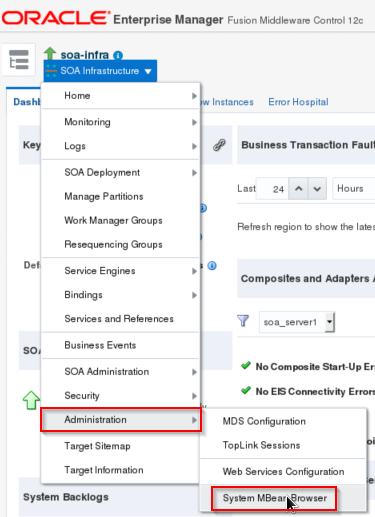 For example, if I use a backup software package to copy operating system or database backups to the Oracle Cloud Storage and restore these services into compute servers in the Oracle Cloud, there is no charge for restoring the data to the compute or database servers. If we do a quick calculation of the pricing for our example previously where we start with 1 TB and grow to 120 TB over a year we can see the price difference between the two solutions but also note how much reading back will eventually cost. This is something that Amazon hides when you purchase their services because you get charged for the upload and the download. for un-metered pricing and for metered pricing. Looking at this example we see that 120 TB of storage will cost us $43K per year with un-metered services but $36K per year for metered services assuming a 20% reading of the data once it is uploaded. If the read back number doubles, so does the cost and the price jumps to $50K. If we compare this cost to a $3K-$4K/TB cost of on-site storage, we are looking at $360K-$480K plus $40K-$50K in annual maintenance. It turns out it is significantly cheaper to grow storage into the cloud rather than purchasing a rack of disks and running them in your own data center. The second way to consume storage cloud services is by using tape in the cloud rather than spinning disk in the cloud. Spinning disk on average costs $30/TB/month whereas tape averages $1/TB/month. Tape is not offered in an un-metered service so you do need to look at how much you read back because there is a charge of $5/TB to read the data back. This compares to $7/TB/month with Amazon plus the $5/TB upload and download charges. Collaborate is a conference for Oracle power users and IT leaders to discuss and find solutions and strategies based on Oracle technologies. This many Oracle experts in one place only happens one per year, and Pythian is excited to be attending. If you are attending this year, make sure to register for some of the sessions featuring Pythian’s speakers, listed below. Collaborate 16 is on April 10-14, 2016 at the Mandalay Bay Resort and Casino in Las Vegas, Nevada, US. Two towers or story about data migration. Story about moving data and upgrading databases. 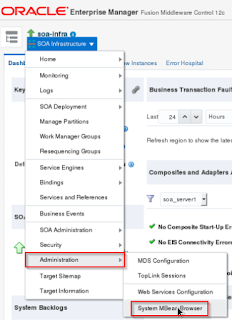 The post Next Five New Features in Oracle Database 12c for DBAs : Part II appeared first on Oracle Trainings for Apps & Fusion DBA. Traditional marketing is trying to get people to notice and engage with your brand. Customer service is engaging with someone who is already invested in your brand. According to various sources, it is anywhere from five to 20 times more expensive to attract a new customer than to keep an existing one satisfied. Today, social customer service is an absolute expectation from consumers and is playing a major role in the customer experience. The impact social service has on business is more than just resolving the issue—it’s driving brand awareness, loyalty, and business value. Oracle Social Cloud certainly understands the importance of social service, which we underscore in our newly released paper, “Social’s Shift to Service: Why Customer Service Engagement is the New Marketing.” The paper states the business benefits of social customer service with insights from customers like Cummins Inc., General Motors, Southwest Airlines, Vodafone, Mothercare and more, as well as insights from leading analysts. Better social service leads to overall better customer service and increased profits. A recent global American Express report shows 74% of consumers have spent more due to good customer service. A recent McKinsey study stated that companies that improve their customer service can see a 30-50% improvement in key measurements including likelihood to recommend and make repeat purchases. There is enormous untapped potential around customer service engagements—powered by social listening—from uncovering new customer and industry insights to creating brand advocates. Social media listening, engagements and insights are critical to most every aspect of business today. But the role customer service plays with social will increase drastically as mobile-social usage continues to soar and consumers’ expectations rise. Social’s shift to service is a sign of our times and a customer experience priority for all businesses. I have a garage full of neat tools. Drill press, miter saw, band saw, table saw, power sander, Dremel, several Milwaukee power drills and portable hand saws, gauges, clamps, vise grips...yeah, the works. But I've learned something over the years; other than other people with a shared interest in nifty tools, nobody cares about the tools I have. What they care about is the speed, quality and cost involved in making things with those tools. I can own the niftiest hammer on the face of the planet, but few people will care; they care about the house I build, regardless of the coolness of the hammer. This concept is not limited to traditional shop and construction tools. Pull out your smartphone. Take a look at the apps. Nobody cares about what tools were used to build the app if it misses the mark on quality, speed, ease of use, or cost. The same holds true for SaaS applications. Customers don't care about the underlying platform...nor should they, when the idea is to make all that complexity transparent to them. Customers care about care about speed, ease of implementation and use, quality (including reliability, depth of features and security), how well the application will perform their business process, and the information the application will provide about those executed transactions. So, to put it bluntly, SaaS is not about the platform nor the development tools. It's about ease of use, quality, and cost. Let's stop talking about the technology and start talking about the things that matter.